Munchkin Munchies: Apple Pie and My First GIVEAWAY! Apple Pie and My First GIVEAWAY! Of course I made a pie, a french apple pie...the kind with the yummy streusel topping:) Mmmmmm:) Soooooo good! With the leftover crust(and a bit of pie filling) I made a few mini apple hand pies:) They were flaky, tasty, and perfect for taking to the football game to share:) My 2 year old grandson still prefers my cookies! And now... to my FIRST GIVEAWAY!!! I have had this item in mind for awhile as a giveaway and I found it at a local farm stand. It's not exactly like the one I own(made by Pampered Chef), but the only difference seems to be the way you anchor it. Plus, this one is a cheery apple RED! You can see my handy- dandy apple(and potato) peeler-corer-slicer(long name!) in action right here. This is a real time-saver! If you've always wanted one of these gadgets, and even if you haven't, now is your chance to get your very own, brand new handy-dandy apple peeler-corer-slicer for FREE! All you need to do to enter is leave a comment and note your favorite recipe that uses apples:) Remember to leave a link to your blog, or your email address, so that I may contact you if you win! The DEADLINE to enter is Tuesday, November 17, 5 :00pm Pacific Time. The winner will be chosen through random.org and announced the evening of November 17th. 2. Mix sugar, flour, cinnamon, nutmeg and slat in large bowl. Stir in apples. Turn into pastry- lined pie plate. Mix 1 cup all-purpose flour, 1/2 cup packed brown sugar and 1/2 cup firm butter until crumbly. Mix ingredients together and cut with pastry cutter until pea size. Set aside. 1/3 cup AP flour and 1/4 cup of water and add to above mixture. Ok, I want this apple peeler. My favorite recipe with apples is...warm apple cake with vanilla ice cream, yummy!!! That French Apple Pie from Betty Crocker is classic, and still the best. Let's see, favorite apple dessert... I love turnovers. It have to be turnovers. make that *has* to be turnovers. Where did my grammer go? Maybe I don't need grammer in Idaho lol. How exciting--a fun giveaway!! My favorite apple dessert is a French Apple Galette--it's the perfect ratio of filling to crust! 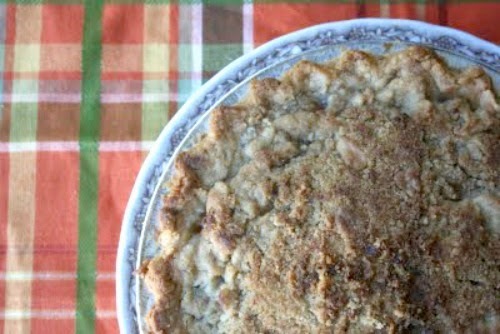 I love apple desserts and your apple pie looks so yummy! I love apple-spice muffins! Yummy! Although I recently made candied apples, and they were pretty fantastic! i love love apple pie!! !your apple pie looks so delicious!! Sue, the french apple pie looks delicious, and so do your mini apple hand pies. I would do the same if I get a basket of apples from someone. Hm, my favorite recipe that uses apple? That should be Apple Crumble Pie. Last week I made a Green Apple Granita. It's my new favorite apple dessert. An apple peeler/corer/slicer could of totally made this recipe faster to make! I'm following your blog. My very favorite is apple crisp!